→ A combination of three of our videos is featured as Movie 13.5 in the textbook “Molecular Biology of the Cell” (sixth edition). → PhD student Emmet Francis adds two more awards and another publication to his record of achievements. 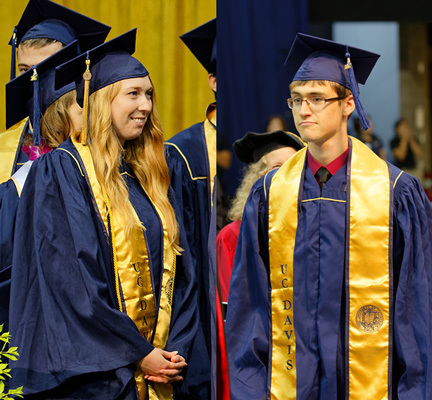 Emmet has won a “UC Davis & Humanities Graduate Research Award” as well as an “Achievement Reward for College Scientists (ARCS)”, both for the academic year 2018-2019. Congratulations! His latest paper, a focused review entitled, “Mechanistic understanding of single-cell behavior is essential for transformative advances in biomedicine“, has been published in the September issue of The Yale Journal of Biology and Medicine, where it has been highlighted by inclusion in the editor’s picks from the current issue. → We are thrilled and proud to learn that first-year PhD student Emmet Francis has been awarded a prestigious 3-year Graduate Research Fellowship by the National Science Foundation. 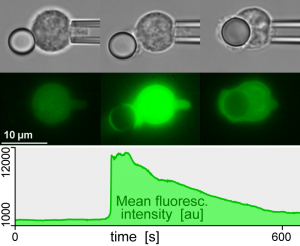 → Our study of the role of calcium bursts in immunotaxis has been published in the March 13 issue of Science Signaling. Emmet Francis, the first author of the paper, did most of his work on this project as an undergraduate volunteer researcher. Links to the full article and a free PDF reprint are included in the paper’s entry in the list of our publications. News articles about this publication have appeared in the egghead research blog and on the BME departmental website. → All our presenters did a great job at the 2018 Biophysical Society Meeting. From left: PhD student Emmet Francis, Undergraduate senior Zhiyu “Hugh” Xiao, and PhD student Trey Simpson. Enjoying Trey’s poster at the far right is Wesley Wong, a former student and now Harvard professor. More pictures are on our facebook page in this gallery. 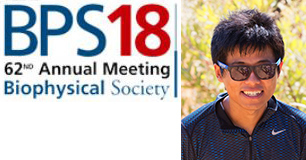 → Undergraduate student Zhiyu “Hugh” Xiao has secured two travel awards to support his attendance of the 2018 Biophysical Society Meeting, one from the Biophysical Society, and the other from the Undergraduate Research Center of UC Davis. Congratulations! Hugh will be one of four presenters from our lab at this conference. → Congratulations to our graduating seniors! We will miss Julie Zimmer, especially her enthusiasm in the lab. We are looking forward to new scientific discoveries with Emmet Francis as PhD student. More pictures are on our facebook page and in this gallery. 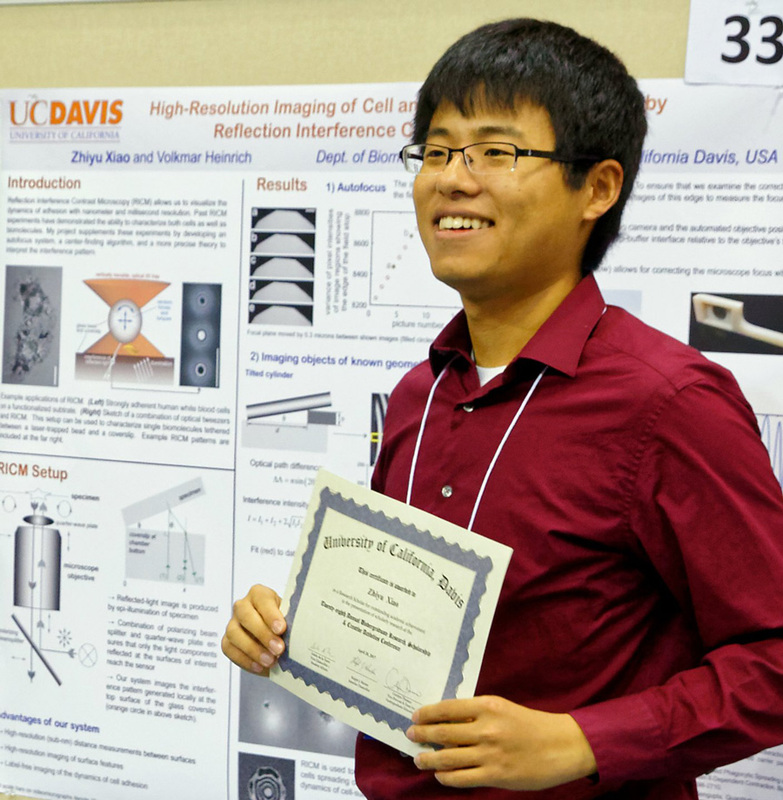 → Zhiyu “Hugh” Xiao, currently a junior, is awarded a 2017 Provost’s Undergraduate Fellowship for his proposal “High-Resolution Imaging of Cell and Molecular Interactions by Reflection Interference Contrast Microscopy”. 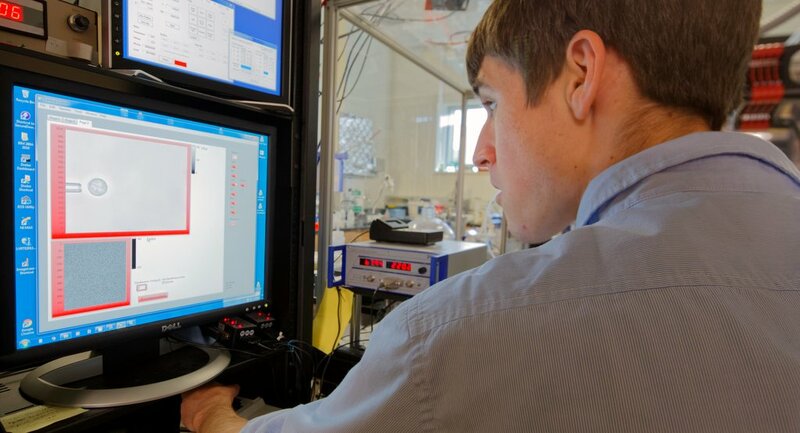 The fellowship will allow him to purchase and 3D-print hardware needed to advance his project. → We are tremendously proud to learn that Emmet Francis has been announced as the winner of the 2017 M.S. Ghausi Medal. The Ghausi medal is the highest honor awarded each year by the College of Engineering to one outstanding graduating senior. Emmet’s accolades to date include authorship on two articles published in high-impact journals, one podium talk and one poster presentation at international conferences, a Provost’s Undergraduate Fellowship (PUF), and travel awards from the Biophysical Society and the UC Davis Undergraduate Research Center. Congratulations! More pictures are on our facebook page. → Two of our 2017 papers explore the sprawling frontier of “immunology beyond immunobiology”. The studies significantly extend our quantitative understanding of immunotaxis – the recruitment of immune cells to sites of infection, trauma, or inflammation. Volkmar Heinrich, Trey Simpson, and Emmet Francis publish an in-depth analysis of chemoattractant gradients, presenting a valuable, ready-to-use mathematical resource for every researcher studying chemotaxis. The study appears in Frontiers in Immunology, the “#1 most cited and #1 largest open-access journal in immunology”. Undergraduate student Emmet Francis is first author on the paper Quantifying the sensitivity of human immune cells to chemoattractant (Biophysical Journal, PDF 1216 KB). 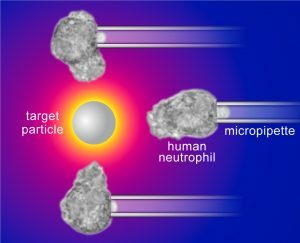 As explained in a BME News article, the study pioneers the use of human immune cells as uniquely capable biodetectors. The article-level metrics used by CellPress give the paper an “attention score” in the top 2% of all outputs ever rated. 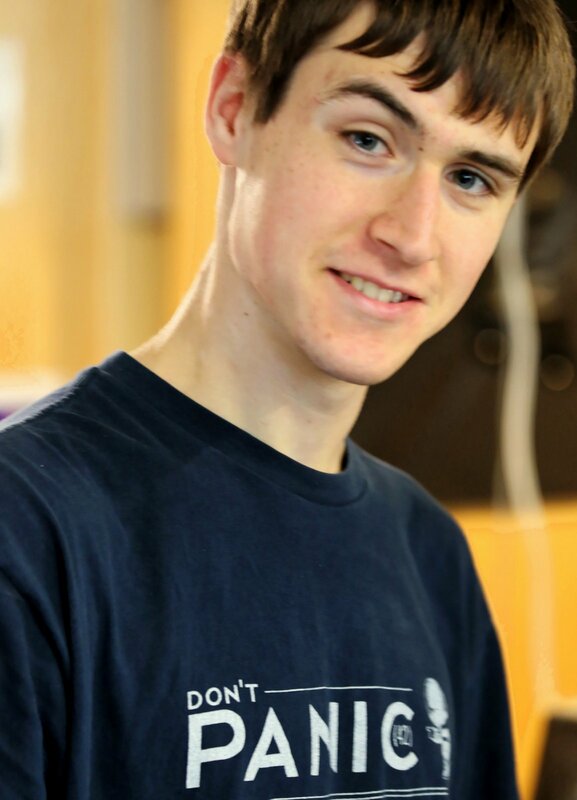 → Undergraduate student Emmet Francis, currently a junior, is awarded a 2016 Provost’s Undergraduate Fellowship for his proposal “A relationship between cytoskeletal remodeling and calcium bursts in human neutrophils”. This award continues an impressive streak of excellent achievements by our undergraduates! → Undergraduate student Zhiyu “Hugh” Xiao receives the prestigious Mertens Sophomore Award of 2016. This award is presented annually to one outstanding sophomore student (selected from currently ~4,800 sophomores of UC Davis) in recognition of high scholastic achievement by the Phi-Kappa-Phi honor society. Congratulations! 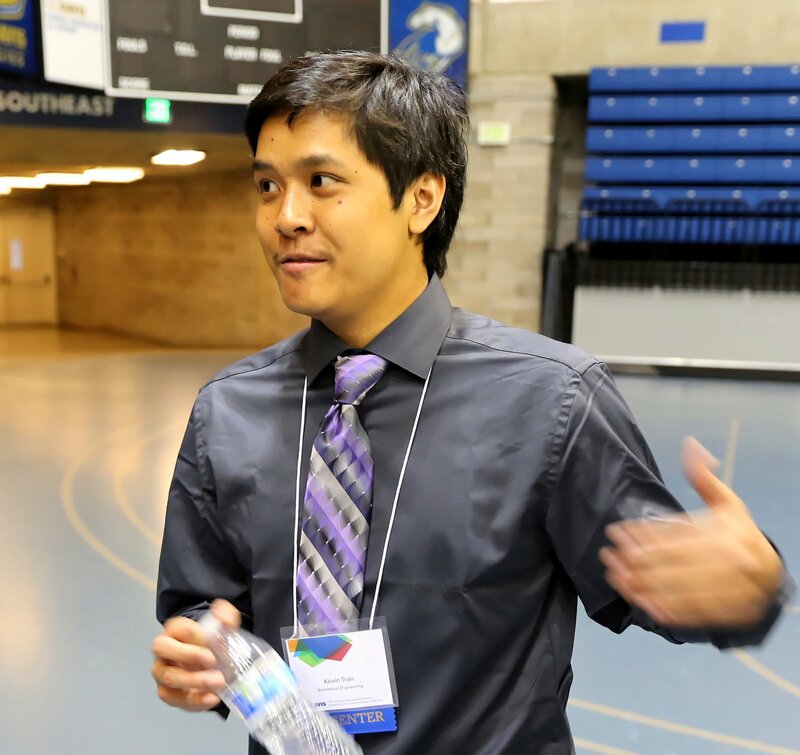 → Undergraduate student Kevin Tran presents his research project at the 2016 Undergraduate Research, Scholarship, and Creative Activities Conference of UC Davis. Kevin’s poster is entitled, “A minimal capsule protects Cryptococcus neoformans from recognition by human neutrophils and monocytes”. → Our research is showcased in three well-received presentations at the 60th Annual Meeting of the Biophysical Society. As one of the youngest podium speakers, undergraduate student Emmet Francis gives a talk about calcium bursts in human white blood cells. Graduate student Trey Simpson presents a poster about a new method to quantify binding kinetics at the surface of laser-trapped particles. → Our paper “Controlled one-on-one encounters between immune cells and microbes reveal mechanisms of phagocytosis” (Biophysical Journal 2015, PDF 1177 KB) presents an authoritative overview of new insights gained from modern, interdisciplinary single-live-cell studies. The article discusses several “universal mechanistic principles of immune-cell phagocytosis in detail, hoping to lay the groundwork for an interdisciplinary framework that provides a useful context for more specialized cell and molecular phagocytosis studies”. → Our paper “Coccidioides endospores and spherules draw strong chemotactic, adhesive, and phagocytic responses by individual human neutrophils” (Lee et al. 2015; see also below) is recommended by a member of the Faculty of 1000 (F1000), which places this work in the F1000 library of the top 2% of published articles in biology and medicine. A recent review categorized our study as “of particular interest” and “of importance”. Instructional videos featuring this research have been uploaded to our YouTube channel. By examining human immune cells, it preempts mounting doubts of how well animal studies carry over to human hosts, and tackles knowledge gaps left by the fact that human cells cannot be cultured or genetically manipulated. It examines mechanisms of chemotaxis, adhesion, and phagocytosis in an integrative manner. This integrative approach is applied to 7 different targets, including 5 pathogenic fungi, under otherwise identical conditions, allowing us to discriminate and rank fungal pathogens in terms of their aptitude to evade recognition. → Graduate student Trey Simpson (left) wins a “Best Poster Presentation” award at the 4th annual BME Graduate Group Research Day (2015). Trey also receives a BME Graduate Group Travel Award to present his research at the 2015 UC Bioengineering Symposium. → Cheng-Yuk Lee, Chenzhou Yu, Christine Hastey, and Volkmar Heinrich, in collaboration with the group of Andreas Bäumler (Dept. 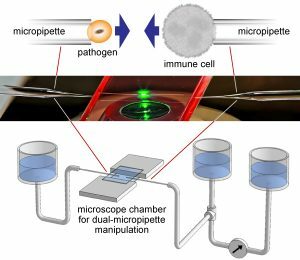 of Medical Microbiology and Immunology), investigated how immune cells recognize Salmonella bacteria from a distance, and how Salmonella Typhi (the cause of typhoid fever) evades this detection. The study was published in PLOS Pathogens (PDF 3912 KB) and highlighted in Nature Reviews Microbiology. It showcases how innovative concepts and approaches developed by bioengineers can provide new insight into the mechanisms of vital cellular behavior, and help us tackle scientific questions that are inaccessible to traditional biological methods. 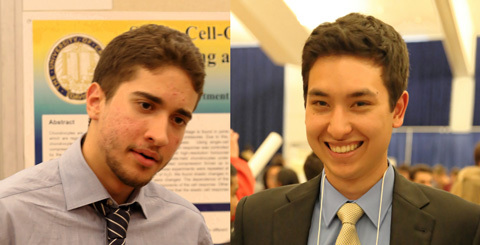 → Undergraduate students Dean Pernas and Corey Long present their projects at the 2014 Undergraduate Research, Scholarship, and Creative Activities Conference of UC Davis. → Undergraduate student Corey Long is awarded a Provost’s Undergraduate Fellowship for his proposal “The Effect of the Cryptococcus Capsule in Immune Recognition”. 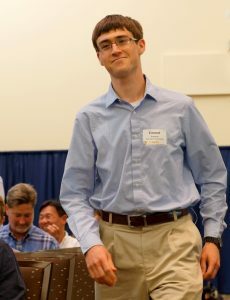 → Undergraduate student Matthew Halverson, who got his first taste of scientific research as a sophomore in our lab, wins the 2012 Ghausi Medal, the highest honor awarded by the College of Engineering to a graduating senior. 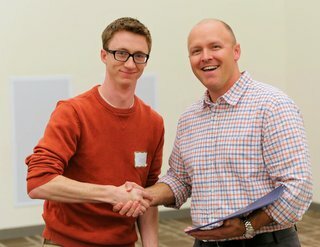 Matt also received the 2012 Departmental citation for “Outstanding Academic Achievement”. → Our paper on E- and N-cadherin binding (Ounkomol et al. 2010; PDF 369 KB) ranks 16th among the most downloaded papers published in the Biophysical Journal in 2011. The paper introduced important innovations in AFM-based mechanical testing of cells and molecules. → Our paper presenting … functionalized microspheres arrayed on AFM cantilevers … (Ounkomol et al. 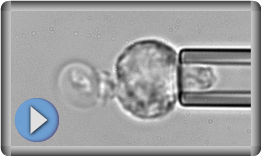 2010; PDF 369 KB; see also below) is selected and evaluated by a Member of the Faculty of 1000 (F1000), which places this work in the F1000 library of the top 2% of published articles in biology and medicine. 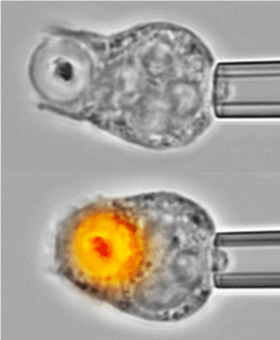 → Our work on phagocytosis is featured in the Spring 2010 issue of Biomedical Computation Review (a magazine published by the Simbios National NIH Center for Biomedical Computing). → Jonathan Lam is first author on a Biophysical Journal paper on macrophage mechanics (2009; PDF 768 KB). 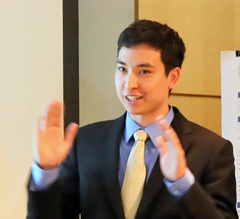 The paper is based on Jon’s work as an undergraduate researcher. → Jonathan Lam receives Departmental citation as “Outstanding Undergraduate Researcher” (2008). → Our paper on “Biophysics in reverse: Using blood cells to accurately calibrate force-microscopy cantilevers” (Applied Physics Letters 2008; PDF 616 KB) is selected for inclusion in two Virtual Journals: the April 28, 2008 issue of Virtual Journal of Nanoscale Science & Technology, and the May 1, 2008 issue of Virtual Journal of Biological Physics Research. It also is featured in a UC Davis press release, in a spotlight of the popular Nanowerk WEB site, and in the book “Nano-Society – Pushing the Boundaries of Technology“. → Chek Ounkomol‘s performance helps secure a prestigious 2-year GREAT training grant sponsored by the UC Systemwide Biotechnology Research and Education Program (BREP, 2008-2010). See also the UC press release. → Our paper on “Force versus axial deflection of pipette-aspirated closed membranes” (Biophysical Journal 2007; PDF 410 KB) earns a “New and Notable” highlight at the front of the Journal. → Our work on phagocytosis mechanics (Herant et al. 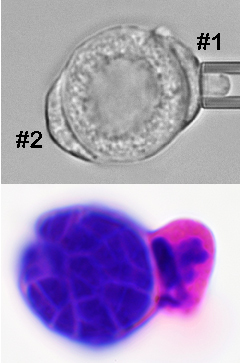 2005 and 2006) is discussed in an Opinion by Hallett & Dewitt (2007) in Trends in Cell Biology. Heinrich Lab | Powered by Mantra & WordPress.